K. I’m going to toot my own horn a bit, and am because it’s not often this Earthling has the opportunity to interact with Extraterrestrials. Much to my surprise and delight I woke the next day to find he marked as a ‘favorite’ the second of the two. 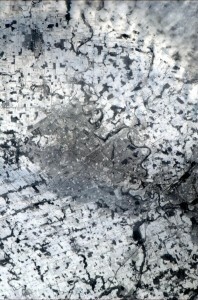 The cities of Kitchener-Waterloo, Canada, taken by astronaut Chris Hadfield aboard the International Space Station. And then a little later in the day he tweeted a photo from space of the city in which I live, Kitchener, Ontario. Here it is. My interest in the space station was first piqued by a YouTube video sent to me last month by the aerial photographer for whom I work. It was a “tour” of the space station narrated by the outgoing commander, Sunita Williams, I thought I might watch it for a minute or two and ended up watching the entire 25 minutes. it’s well worth the view. And by the by, if you haven’t seen the recent brief Twitter exchange involving Hatfield and another Canadian, William Shatner, aka Captain James T. Kirk, it’s fantastic, as are the tweets that followed it. This entry was posted in Heart-Stopping Stories and tagged Hadfield, International Space Station, Kitchener, Shatner, space, Toronto, Twitter on January 8, 2013 by Craig Daniels.